Tritone substitution is a good way to add some new ideas to your II V I lines. It is very closely related to using altered dominants, but the fact that you think another chord will also give you some new melodic ideas. In this lesson I’ll try to briefly explain how it works and also what scales and arpeggios to use before I put that to use in some examples. Let’s first look at what a tritone substitution is, in this lesson I’ll do my examples in the key of G major, though it works just as well in minor of course. The easy way to look at this is to notice that with shell voicings for dominants (see 3rd bar of example 1) you can change the root but keep the rest of the chord, so the 3rd and 7th of a dominant chord are shared between two roots a tritone substitution. In this example that shows that the tritone substitution of D7 is Ab7, and if you play through example 1 you can hear how it will work in the II V I cadence. You will also probably notice that it is not that effective if the dominant does not resolve to a I chord. So now we have a new option for a chord and a way to place it in a tonal context. The next thing we need to look at is which scales we can use when improvising over it. In example 2 I’ve listed first the key of G major and then the Eb Mel minor and Db Major scale. THe G major scale is mostly there for a reference to the key and not for the Ab7 chord. If you’ve checked out my lesson: Melodic Minor – Lydian Dominants You could observe that the Ab7 is a dom 7th chord that does not resolve a 4th up (or 5th down) so in that way it is a lydian dominant and you can use Eb melodic minor over it. That is the 2nd scale in example 2. Another option would be to just observe that Ab7 is the dominant in Db Major and therefore we can use that scale over it. This is the 3rd scale in example 2. Now we have the scales let’s just quickly go over a few arpeggios. In example 3 I basically move up in diatonic 3rds and list the arpeggio for each note, which is the first way you should look for arpeggios over a chord in any scale, then you need to evaluate each note and try to deal with avoid notes as landing notes when you use the arpeggios. In the example I have only used the Eb Mel min scale, but if you want to do the same. The first example line is a fairly basic line just to show what the sound of the Ab7 chord can already do in the line. The Am7 line is an Em7 arpeggio (arpeggio from the 5th of Am) followed by a scale run. On the Ab7 I first play a pattern of the Ab7 arpeggio and then another scale run ending with a chromatic encirclement of the 5th(D) of Gmaj7 where it resolves. In the 2nd example I am using the Ab7 chord as if it is from the Db major scale. Which gives us a Db in the scale which is a bit further away from the G major tonality. On the Am7 chord the line is a melodic sequence of a Cmaj7 arpeggio which sort of changes into an Em pentatonic scale run. On the Ab7 I first play a Ebm7 arpeggio and then run down the scale before resolving to the 3rd (B) of Gmaj7. The 3rd example again using the Eb minor melodic on the Ab7 chord. The line over the Am7 is constructed by first an Em7 shell voicing and then an Am7 triad in 1st inversion. On the Ab7 I first play a pattern of the GbMaj7(#5) arpeggio and then descend through a Cm7b5 arpeggio before resolving to the 5th (D) of Gmaj7. 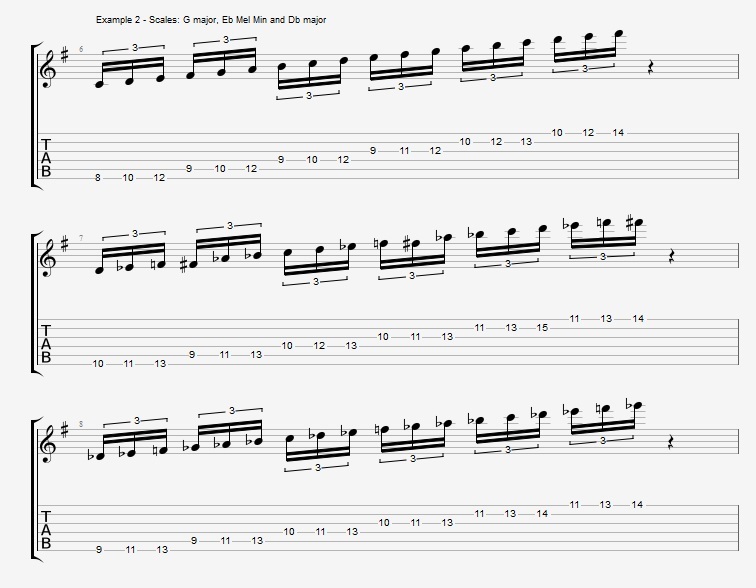 This entry was posted in Blog, Lesson and tagged altered scale, arpeggio, arpeggios, jazzguitar, melodic minor, pdf, practice method, scale, Theory, tritone, tritone substitution, Video Lesson, YouTube on April 9, 2015 by jens.